DIGiMON, DiGIvolve!! still remember this phrase? i guess it bring back a lot of good memory. 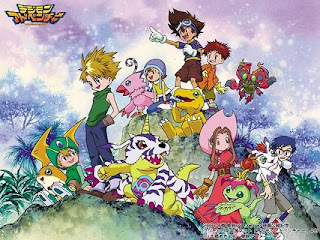 Digimon (DIGITAL MONSTER) is one of the Bandai project since year 1999, digimon launch by bandai through a electronic device. 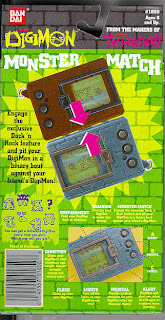 it was similar like Bandai's previous electronic pets but this 'digimon' different with the Bandai first electronic pets( Tamagotchi) which launch at year 1992, besides can feeding, training, clean the 'shits' , it also can battle with other digimon when both device linked together. .
To enforce the Digimon market, after one year Bandai launch another Digimon device call Digimon pendulum with different version. with more function and different types of monster. Since Digimon is a very profitable market, Bandai used the opportunity to make more profit by launching Digimon Animation. After launched Digimon animation, Bandai introduced a new digimon device call 'DIGIVICE' (Digimon Battle Device)which a device from the animation. User can choose different type of digimon they like to start the adventure with the device, user has to shake the digivice and the digimon will start walking, the digimon will meet its enemy and start fighting, user can help the digimon to evolve into different form or level during the battle. after one year, Bandai launched digimon zero two anime along with another new digivice. Bandai continue to make new animation and new digimon every year until now and Digimon already reached 10 years old. hey Leng Zai. still playing with DIGIMON ar? haha.